My last encounter with apricots didn’t go so well. 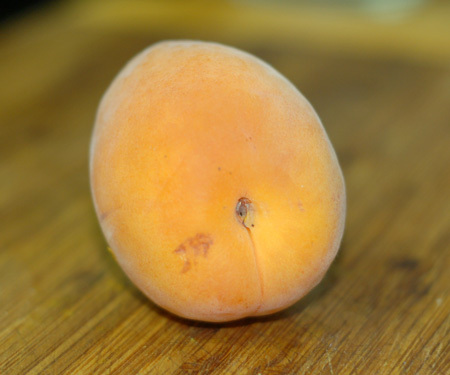 Somehow I had been expecting the fruit to be sweeter and more fragrant than peaches, without the stringy centers and thick furry skin to blanch and peel off. (Can you tell I’m not a big peach fan? Far too many textural issues to overcome unless I spend a lot of time processing them and hiding them in baked goods. And please don’t suggest the canned variety… ew. However, that means I should probably go buy peaches next time I hit the farmer’s market.) 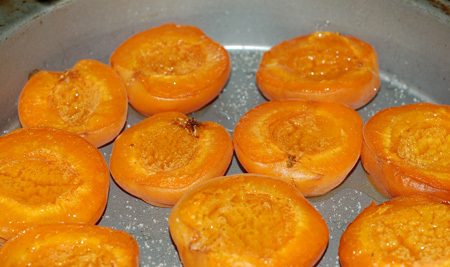 In any case, the apricots I baked with last time seemed to be no less tart than plums, and I’ve had very little interest in working with them since. But after buying an armload of vegetables and pint baskets of boysenberries and pink gooseberries, I only had two dollars left in my wallet—not enough to buy cherries, but just right for a basket of fuzzy orange apricots. This time, after a nibble determined that this year’s apricots were no more to my taste than the previous batch, I opted to roast the fruit with a sprinkle of sugar, puree the meltingly tender results, and turn it into frozen yogurt. 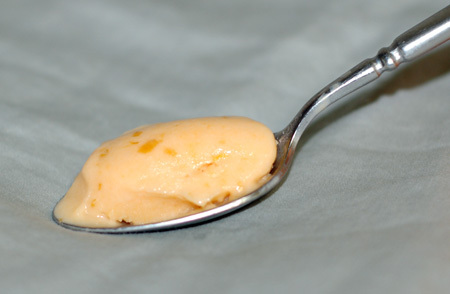 I ended up with a creamy dessert that, oddly, reminded us of nothing so much as a creamsicle. Preheat your oven to 400F. Place the apricots in a nonstick pan, spritz with a little olive oil, and sprinkle with 2 T sugar; roast for about 20 minutes, until virtually tender enough to fall apart. Allow to cool, then puree in a blender or food processor, reserving half a cup of diced apricots for texture, if desired. In a large bowl, stir together yogurt, milk, apricot puree, vanilla and 1/2 C sugar until thoroughly combined; taste and add a bit more sugar if your apricots were particularly sour. Cover and refrigerate until cold. Churn according to your ice cream maker’s instructions (add the reserved diced apricot when the frozen yogurt is nearly done, if using).